Brisket is a cut of meat that matches perfectly with smoked aromas and flavors. Its soft and tender textures makes it perfect for absorbing moisture and smoke, so it’s important to pick the right wood to smoke with it. With a lot of varieties of wood out there, how should you know what to choose? Here are my top 7 picks for the best wood for smoking brisket. Brisket is one of the most popular cuts of meat for barbecue. When cooked right, there are few meats better. Its meaty fibers housed under a fat cap mean that it can be a tough meat but also beautifully tender. To get it right, it has to be smoked for a long time at a low temperatures. It also has to be matched with the right kind of wood. Choosing the best wood for brisket will determine if your final product is soft, tender and flavorful or just a mess. If you’re looking for a failsafe option then either oak or hickory are the best to go for. 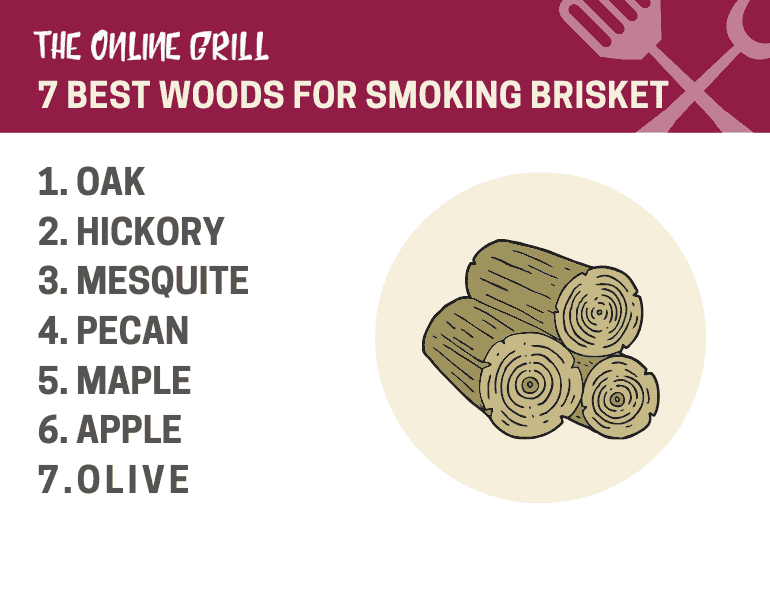 Other favorites with BBQ smoking enthusiasts are pecan, apple, mesquite, maple, or olive. New to smoking meat? Check out my guide to the best meats for smoking. One of oak’s strengths is that it produces a smokey flavor that matches wonderfully with brisket. It's long been a popular wood choice, partly owing it to it being one of the easiest types of wood to smoke with. 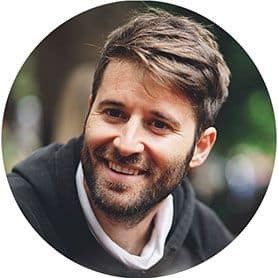 One of the reasons for this is its long potential burning time, meaning that you don’t need to tend to it as much as you would for other types of wood. Not only this, but its flavor profile is far more subtle than that of hickory or mesquite, so you can match with it other types of wood to produce a more fully rounded taste. When choosing a good oak wood, we want something that creates a good amount of heat and smoke both as fire and smolder. 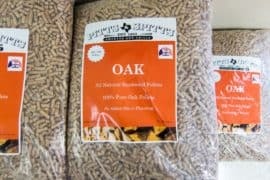 This white oak variety from smoak firewood cooking does just that. White oak in particular is a great smoking wood. The wood logs are large. This isn’t a problem if you’re using oak as your primary smoking fuel, but if you’re hoping to use it as a secondary flavoring wood then you ought to consider something else. I don’t consider this a big loss however, as oak is a far better primary fuel than it is secondary. 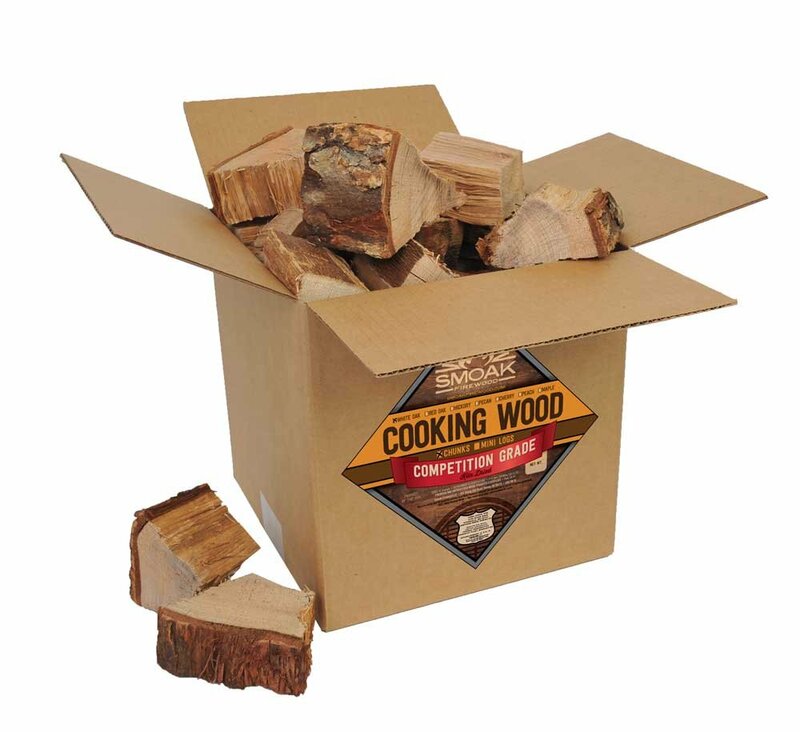 It comes in several sizes, allowing you to either buy in bulk or start more modestly, and starts at very affordable price so you’re not breaking the bank if this is your first smoking wood. Hickory remains one of the world’s most popular types of wood for smoking and barbecue, mainly due to its beautiful nutty flavor. It’s available almost everywhere, so in the case of brisket it makes for an excellent fallback option if you can’t find anything else. That said, it’s still an excellent choice. It has an oak-like flavor that is not as strong as mesquite. Despite this, if you use too much of it then you do still run the risk of letting it overpower your meat with a very define bitter taste. In order to ensure that you don’t go too far with it, try to tone it down by using slightly less of it, or even by diluting it with some applewood. Hickory is also smokey, but packs in a stronger smoke flavor than oak. People might prefer this, but one of its drawbacks is that the smoke it produces isn’t as clean as oak. However if you're planning to smoke your brisket hot and fast, and only for around 2-3 hours then a blend of hickory and oak is a great way to go. If you want to go for something that packs in a denser, more smokey flavor then hickory might be the wood for you. Hickory goes great with brisket. The tough meaty fibers of the brisket mean that it can stand up to the strong and pungent flavors of hickory, and can absorb them beautifully. Where better to turn than Weber? 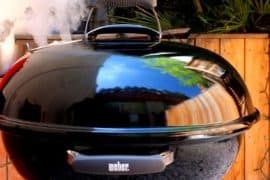 The German brand have been making excellent BBQ grills for years, so they know a thing or two about making great BBQ fuel. 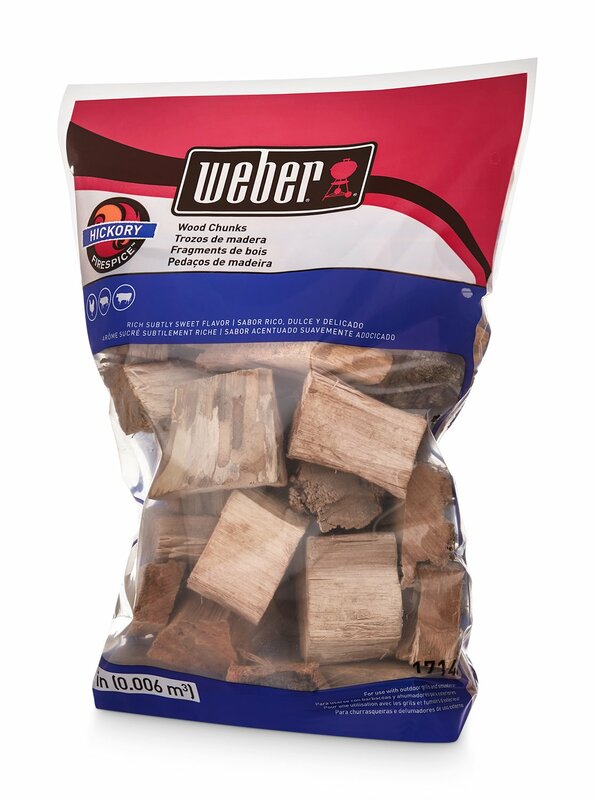 These hickory wood chunks from Weber can be used by themselves as a primary fuel source, and can be matched with your oak wood if you want to make something a bit more mild. Each bag is two pounds in weight, which means you can easily start small to test them or go large and buy in bulk. Each wood chunk is uniformly sized at three inches, and is just as solid and dependable as you’d expect from a brand like Weber. 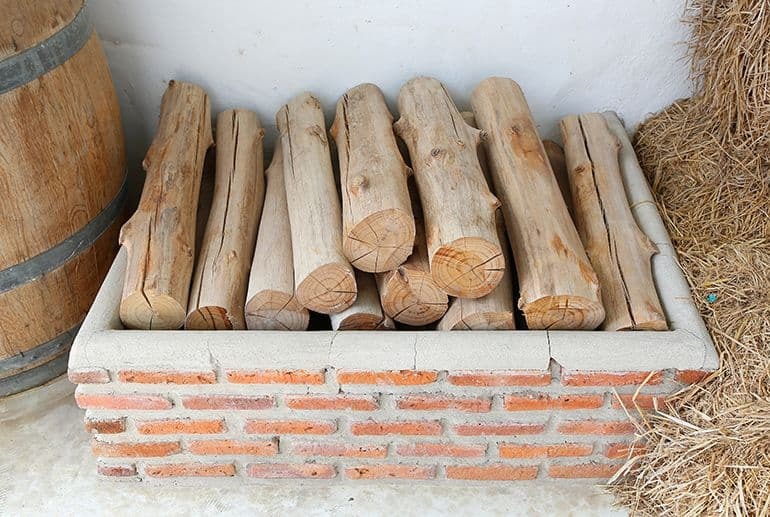 This is one of the most commonly used types of wood out there for smoking, particularly for brisket. It’s one of the staples of Texan smoking, and for good reason. It’s a pungent wood that packs in a very intense flavor. One of the flaws in mesquite is that it does tend to burn through quite quickly, so you’ll need to use a good amount if you’re cooking a particularly large cut of brisket. If you’re unsure about pairing an intense wood like mesquite with brisket, then what I’d recommend is mixing it with a softer wood. For example, you can dilute it by mixing it with apple wood to give it a softer edge without compromising too much on overall flavor. Definitely not for everyone, but pecan produces a beautifully sweet and rich flavor that, in my opinion, works brilliantly with BBQ brisket. If you want to dial down its sweet aromas a bit, then you can temper it with some oak to even it out. Maple is another great wood for newbie smokers. It’s a mild wood that imparts a light smoky and sweet taste on brisket without ever overwhelming it with its aromas. What I particularly like about maple is that not only does it go really well with brisket, but also other types of meat. I’ve used it to great effect with poultry and pork. I’ve mentioned apple wood a couple of times already on this list, but I also wanted to mention it in its own right as well. It’ll come as no surprise that it has a lovely fruity and sweet flavor, but it’s also a great diluter for use with other woods to try and even out any strong flavors. It goes beautifully with brisket, but also turkey, ham and chicken. If you prefer something with more nuanced flavor and that offers something a little sweeter, then a fruity wood like apple could be a great choice. Applewood tends to emit dense smoke, which is great at infusing the tough textures of brisket with flavor. It’ll add a sweet flavor and a more subtle layer of fruitiness. This can be used as both a primary or secondary fuel, either forming the focal point of your smoke, or it can be added to oak to add notes of sweetness. 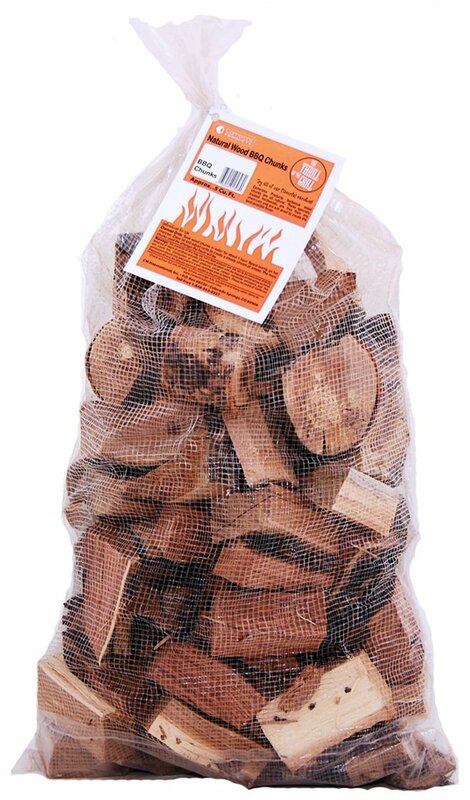 These chunks come in at about 4 inches, and come in a 10-pound bag, so plenty of wood to get you started, at a very affordable price. Olive wood isn’t always the first to come to mind for people choosing wood for smoking, but I think it deserves to be mentioned. It’s a far more mild alternative to mesquite, in that it features a fairly similar flavor profile but just isn’t anywhere near as overpowering. As well as brisket, it goes beautifully with poultry and even, if you’re feeling brave, fish. Before deciding on flavor, I think it’s also important to take size into consideraton. In general, there are three different sizes of wood to choose from. Logs. Sometimes intimidating in size, but perfect if you’re using an offset smoker due to the large amount of smoke they emit. The downside is they can be difficult to ignite and keep lit, but fantastic with the right smoker. Chips. 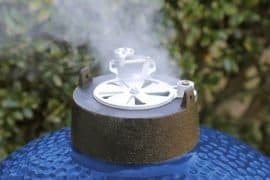 My go-to if using a charcoal grill or electric smoker. Sometimes called wood shaving or scraps, these are very small. As a result they do burn out very quickly, so only really suitable with smaller cuts of brisket. Chunks. These can also take a while to ignite, but they do burn for a very long time. These are the perfect choice if needing to smoke for long period of times. While offset smokers do tend to be the choice of more seasoned BBQ pros, the truth is that a lot of home users tend to use electric or pellet smokers. There’s absolutely nothing wrong with this, but it’s important to know how this can affect your cooking. While offset smokers tend to product a consistent stream of smoke, electric smokers tend to emit smoke in waves or billows. What this means for your meat is that it’s more difficult to impart a strong smoke flavor on the meat, particularly one with subtle nuances. As a result, if you’re using a mild wood like oak then you run the risk of the final flavors being quite weak. To get around this I’d recommend mixing in a bit of hickory to try and kick up the flavor profile a bit. Electric smokers are limited, so hickory will help you get more out of the smoke that you do have to play with. If you’re still unsure about hickory, then try to infuse some of other recommended woods: Pecan, apple, mesquite, or cherry. 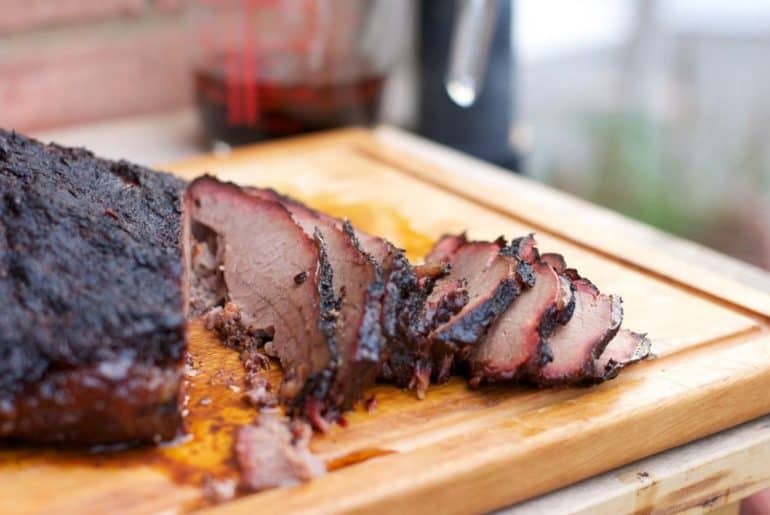 The sweet notes particularly of cherry and apple give a fantastic balance to the more grounded smoky aromas of the oak.Brisket is a tough cut of meat comprised of tough fibers. To break these down and tenderize them, they need to be exposed to exactly the right kind of smoke. Both oak and hickory offer a dense and heavy flavor profile that will smolder for the duration of your smoking, helping to break down the stubborn fibers of the meat. Brilliant stuff love the look of the brisket. Sending straight to my husband.